Students Instagram their photo of the Vietnam War Memorial in Westminster. They also capture their UC Irvine ID card as evidence of their visit to the site. But this summer in my Asian American Histories course, I did something quite different. I made Instagram a crucial part of their grade. What led me to look beyond “caveman” tools? For one, in my earlier spring course I created a blog where students volunteered to post their literary journalism assignments. I happened to have a number of Southeast Asian American students, and a few of them interviewed elders who recounted harrowing stories of war and survival. I thought, “What makes me so special to be the only person to ever read these powerful stories?” I decided a blog would be the perfect platform to display their stories (with permission) to the public. I used parts of this blog as required reading for my summer class (one student told the class she cried after reading it). Another reason I turned to Instagram was because a few of my well-seasoned colleagues were using it. I felt I was missing out on something new. Roderick N. Labrador at the University of Hawai`i, Manoa creates Instagram hashtags which students use to post pictures about their class experiences. “You should meet students where they’re at,” Rod advised me. Robyn M. Rodriguez at the University of California, Davis calmed me down one day as I pulled my hair out while writing my summer Asian American Histories syllabus. Advocating for a technology-positive classroom, she referred me to her syllabus, which required students to articulate connections between their Instagram photos and class topics. Understanding that the virtual universe is useful for documentation and my colleagues’ embrace of Instagram, I designed a project that prompted my students to document Asian American communities through Instagram. 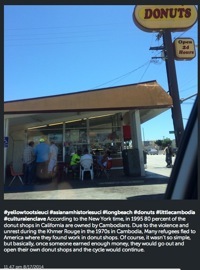 Simply put, in groups of 3-5 they visited a Southern California Asian American commercial or historical district and took photos of their experiences using their smart phones. They then posted these photos on an Instagram account they created or already owned. Digitally-motivated, students got out of their dorm rooms and into the “real world” where they touched architecture, conversed with ordinary folks, and tasted local food (this last one was apparently supremely urgent to them). They had to justify each Instagram photo (whether it be a Buddhist sculpture, an ethnic dish, or a war monument) with a class lesson. What is the relevance between religion and community-survival? How did this type of cuisine flourish in a niche market on the North American continent? What are the politics of national flags among war-torn refugees? Students tagged each post with the hashtag #asianamhistoriesuci so that anyone with an Instagram-friendly application can retrace my students’ journeys. Curiously, hashtags facilitated new, digital bonds of identification. Group members bonded using their invented group hashtag and the class became a virtual community through #asianamhistoriesuci. Essentially, as representatives of their hashtags, students became accountable to their own group and the whole class. They were also accountable to the larger public as their grade depended on how much likes and comments they received on their posts. 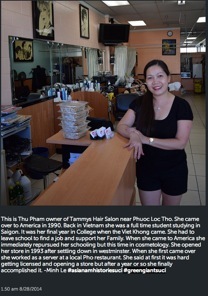 In the end, my students yielded a vast archive of beautiful photos of Little Cambodia in Long Beach and Little Saigon in Orange County complete with concise political and historical commentary. 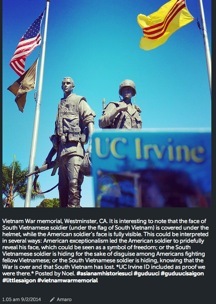 Since any Instagram user can tag #asianamhistoriesuci, my hope is for future UC Irvine students to add to our archive. 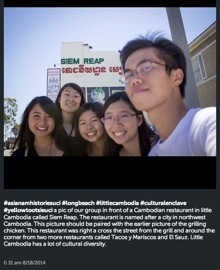 In fact, since hashtagging can be endless, non-UC Irvine students are invited to document Little Cambodia, Little Saigon, or other immigrant/refugee communities using #asianamhistoriesuci and attach their own hashtag to develop their own Instagram archives of immigrant/refugee communities. Conceivably, a multi-hashtag network of archives could emerge. While I still groan at the thought of students’ being distracted by social media during lecture, I can now respect the importance of social media in their everyday lives. The variety of digital tools with which students regularly engage can offer interesting and creative learning methods. Through this project, I understand that relying on “caveman” tools may limit today’s students’ “real” processes of learning. 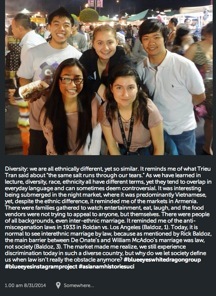 Mark Redondo Villegas is a PhD candidate in the Program in Culture and Theory at the University of California, Irvine. He is a co-editor for the pioneering anthology Empire of Funk: Hip Hop and Representation in Filipina/o America (Cognella Academic Publishing, 2014). His research locates Filipino American hip hop performance within the historical context of U.S. imperialism and diaspora. He is a navy brat who grew up mostly in Florida. He also writes/performs poetry and has produced documentary films on hip hop culture among Filipinos in the U.S. and in the Philippines.